Craig Kilborn is BACK... selling macaroni and cheese??? 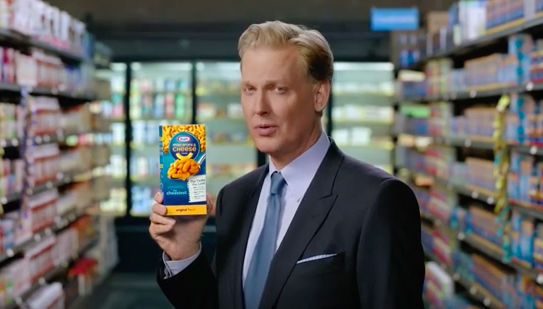 Craig Kilborn is BACK… selling macaroni and cheese??? The former SportsCenter anchor and Daily Show host was one of the most eclectic and interesting personalities to ever grace the Bristol stage and went on to have a moderately successful career paving the way for the likes of Jon Stewart and Craig Ferguson in late night. But after leaving The Late Late Show in 2004, Kilborn mostly disappeared. He had a test run for a show on Fox in 2010 that didn’t pan out and has had a couple of small TV and movie roles since. His most notable ones being a cameo in The Extendables (that’s the parody version) in 2014 and appearing on an episode of Chuck in 2011. Well, we finally have an answer to the mystery. Craig Kilborn is back, ladies and gentlemen! He’s back and he’s… now a spokesperson for Kraft Macaroni & Cheese?!? Craig Kilborn appears in new TV commercials as a pitchman holding a new box, which now calls out the ingredient changes in bold lettering. The actor was chosen “because he can deliver that message in a way that’s very consistent with the tone of our brand and he can really say it with a smile,” said Mr. Guidotti. Wouldn’t you think with FS1 going towards a late night, opinion/comedy vibe and recycling lots of former ESPN people that Kilborn could be a good fit there? Isn’t there some show or network that could give him something a bit more sustainable? Who knows. Kilborn has always marched to the beat of his own drum so maybe this is what he prefers.